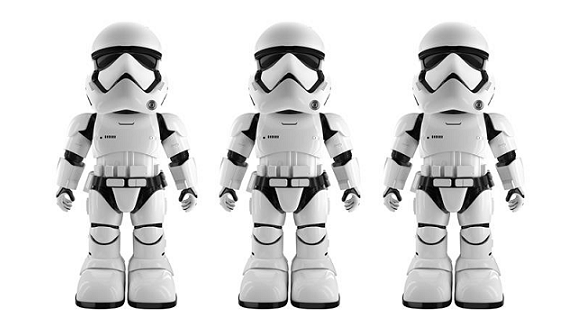 Build Your Army with First Order Stormtrooper! Star Wars: The Force Awakens introduced fans to a new breed of stormtroopers under the command of the First Order and this time without waiting for The Last Jedi later this year you can assemble your own stormtrooper army. UBTECH Robotics has recently unveiled its stormtrooper robot and its intimidating enough to scare off everything around. You can command your First Order Stormtrooper Robot to carry out the selected mission or you can create your own in the companion app. There is a blaster in mission mode to achieve success. You can create a database of up to three faces using the facial biometrics feature for customized interactions. You can even issue orders directly to your robot through voice commands, and also through an app. Amazingly, this robot will remember the defined three faces and follow rules and commands through facial recognition and AR to keep fans entertained.